PORTLAND, Ore. (June 13)- Ecliptic Brewing and Portland Beer Week have come together to present the third annual Masters of IPA invitational. This year’s event brings together 14 of the best India Pale Ale brewers from across the country to share their brews during PDX Beer Week. 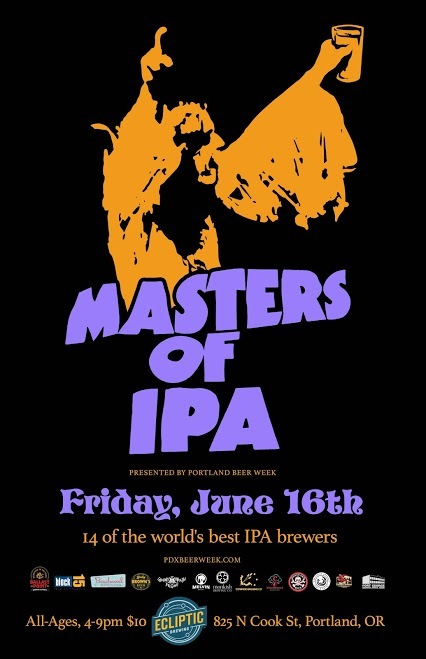 Masters of IPA III will be held this Friday June 16th from 4-9pm in Ecliptic’s expansive outdoor space overlooking downtown Portland. The event will feature collectible glassware and an exciting IPA list curated by organizers Erin Grey Kemplin (Ecliptic Brewing) and Ezra Johnson-Greenough (Portland Beer Week). Participating Breweries: Melvin Brewing, Grains of Wrath, Cloudburst Brewing, Breakside Brewery, Boneyard Beer, Barley Brown’s Brew Pub, Great Notion Brewing, Ecliptic Brewing, Block 15 Brewing Co., Beachwood BBQ, Monkish Brewing Co., Fort George Brewery, Comrade Brewing Company, and Ballast Point Brewing Company. Entry package is $10 and includes collectible Masters of IPA glassware and 3 drink tickets. Additional drink tickets are $2. *Some beers will only be available in 4oz pour size. Ecliptic Brewing will have limited food items available in the outside area. Full menu and Ecliptic beers by the pint will be available from the pub. For more details including a sneak peek at the beer list visit here. Masters of IPA III image here.